Parents strive much to save wealth for the future of their kids. Wealth demands money whereas health demands your time. Invest your precious time in building up the health of your little one. As you know, “Health is wealth”! Any lottery luck might make one wealthy. But, health has no role for luck! One have to work continuously to posses it and still more progressively to sustain it. When it comes to babies, the responsibility relies on the parents. Build their health and gift them a healthy future! 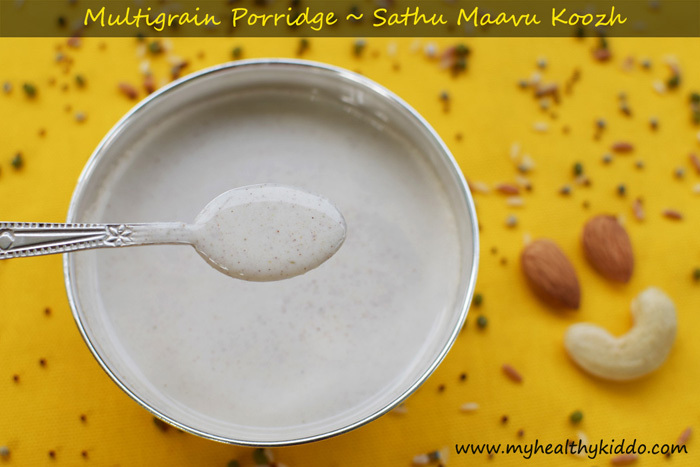 I have already posted on how to make homemade Multigrain powder/Sathu Maavu for 1-2 years babies and with little addition of ingredients for 2+ years kids and adults. Please avoid store-bought powders and make your own batch for your kid. Once the powder is ready, you will have hustle-free mornings with this quick & healthy breakfast. 1. 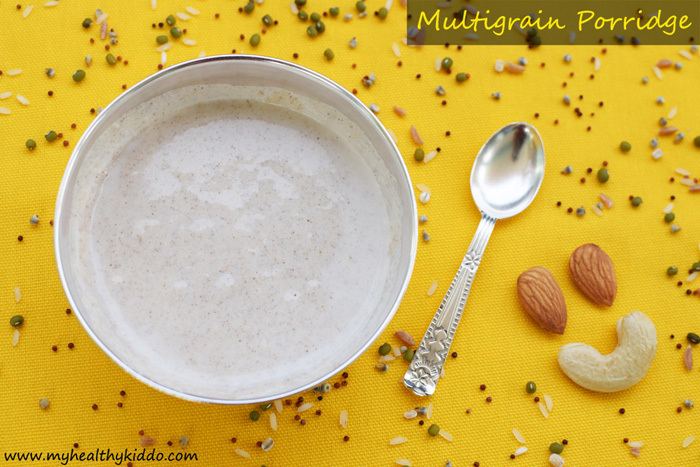 Mix multigrain powder with warm(not hot) milk. Mix thoroughly so that there are no lumps. 2. Cook in medium flame for 1/2 minute and then simmer. Keep stirring for 5 mins until desired consistency reaches. Add ghee and stir for 1/2 minute. Switch off the stove and transfer to a clean bowl, immediately. Add a topping of Mother’s milk.. Feed warm and fresh! Mother’s milk should not be cooked. So, just add it as an additional healthy and tasty topping. 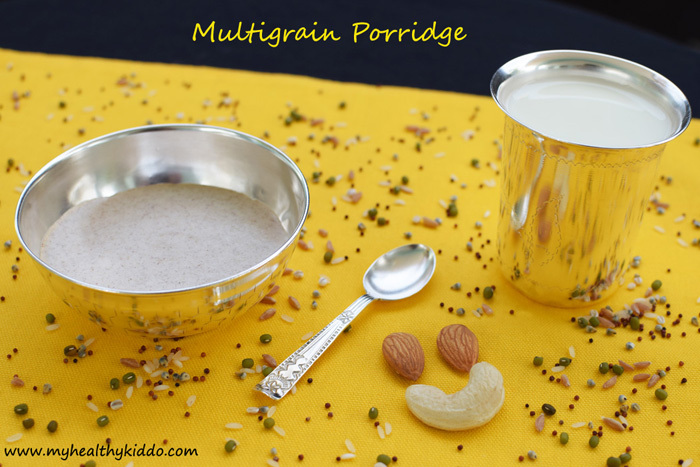 Use boiled cow’s milk to make this porridge. Do not add water while boiling milk. Once prepared, transfer to the feeding bowl asap as it dries faster in the hot pan! This porridge thickens over time. It tastes good when its still warm and fresh. So, just make few minutes before you wish to feed. This porridge is best suited for breakfast. You can also feed in brunch time or evening. Not advisable for dinner as it takes time to digest. I have practised Nilaa to this taste. 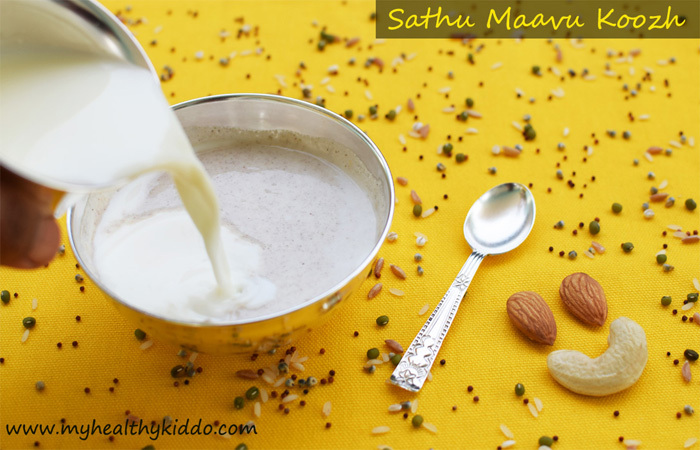 If you need, you shall add filtered jaggery syrup to it after adding milk.